A messy journey through motherhood, crafting, and using essential oils on a houseful of monsters. So I had posted on Facebook some time ago that my Itovi had arrived. What the heck is an “Itovi”? Well I’m going to tell you what it is and what it ISN’T. There it is, in all it’s tiny glory. 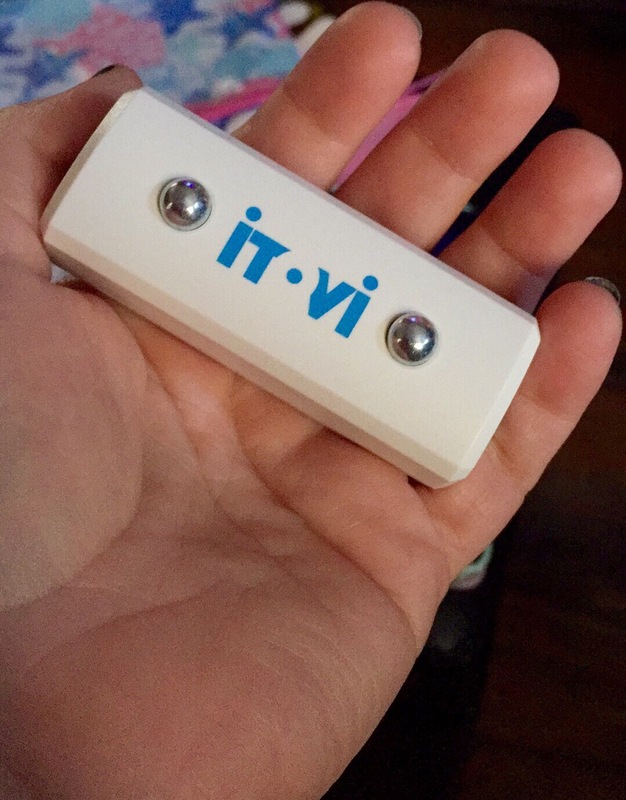 The Itovi is a personal scanner. Sounds pretty sci-fi, right? And in so many ways, it kind of is. The Itovi uses a technology called “Bioimpedance” to tell us about our own bodies and health. Bioimpedance is the same technology used in most of the fitness trackers people are using these days. Basically, tiny frequencies of electricity are used to bounce around and report back on what is happening in your body. That’s probably the least scientific way to explain this, but Google. Just. Google. So, the read out you see is actually from Pixie’s most recent scan. Now if you’re like my dad, you’re probably looking at this wondering what any of this means. As you can see, of the 273 bio points scanned, 72 of them can use improvement. Now this information is based off of so many variables: sleep, stress, diet, exercise, water intake, and so on. What this scanner doesn’t do, is diagnose. I am not a doctor and I’m not going to tell you that you have small pox, or the measles, or whatever else. But this scan shows me that based off of this readout, Pixie would have the most beneficial results using Petitgrain. 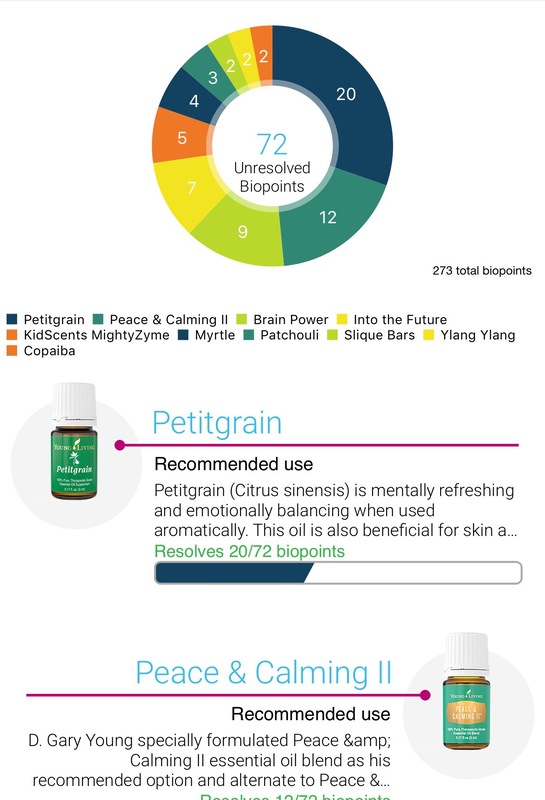 It gives the Young Living description of each suggested oil or supplement and nothing more. So now what? Now, I would take this information and research Petitgrain on my own. Knowing what it assists with and what benefits it has leads me to a plan of action as far as how I would use this oil on Pixie. And that’s the gist. Do you need extra knowledge of oils to use the scanner? Not necessarily, but it certainly helps fill in some of the gaps here. I’ve been more or less running the scan and then providing each person with a full break down or “oil map” letting them know the nitty gritty details. Overall, it’s an amazing tool that offers the most customized results possible. Regrets? None. I will say, the results we’ve seen have made tremendous sense when considering our various health concerns. I even eliminated one of the supplements I’ve been taking for a few days (totally intentional, not because I’m lazy. Ha!) and low and behold, there it was in my next scan. Voo doo! Or, even better, science! So cool. I think it goes without saying, I’ve received no compensation or product for this post (seriously, no one would pay for this). I just wanted to share how excited I was over this new gadget! Previous PostI Plead My Case…Next PostBecause I Have To.